We have had Level-Xs, Primes, EXs, Primals, and Mega… Now it is time to usher in the age of the GXs. With the release of the newest Pokémon Trading Card game set; Sun and Moon, comes the introduction of a new type of Pokémon called a GX Pokémon, and a new game mechanic in the Pokémon GX attack. GX Pokémon are very similar to EX Pokémon in that they offer two prizes when knocked out, most are available in full arts, and they have a weird prefix. However, unlike EX Pokémon, GX Pokémon may be basic, stage 1 or stage 2. More importantly, in addition to their usual attacks, each GX Pokémon has a special attack called a GX attack. Players may only use one GX attack during each game, and they may only use it once. 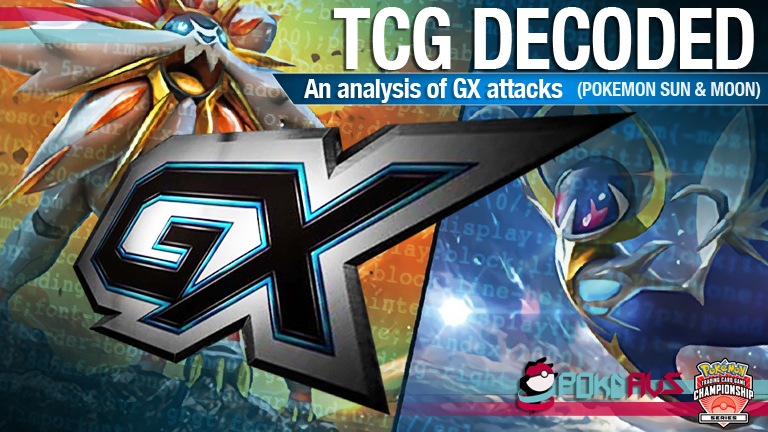 GX attacks can be particularly powerful, and it is usually worth including a GX Pokémon in your deck. Some players may opt to play GX Pokémon like an ASpec, or with a deck centred around one GX attack, while others may play many GX Pokémon so they have options for their GX attack depending on the match-up (similar to a big basics deck). While it’s true that a card’s GX move doesn’t exist in a vacuum, and it is important to consider all aspects of a card when determining whether it warrants a space in that tight 60 card list. It is also important to ask yourself- If this is the one and only GX move I get to use in a game, would I really want it to be this one? a) Splash-ability: Ease with which the GX card could be included in this deck, and how easy it is to fill the energy cost of the GX attack. b) Intra-card Synergy: How well the GX attack works with other attacks/ abilities/ features of the GX card e.g. the energy cost or effects of abilities and other attacks. Essentially answering the question- does this card support itself? c) Offensive/ Supportive Power: The quality of the GX move i.e. how much of an impact the move could have on the game in the context of this format. 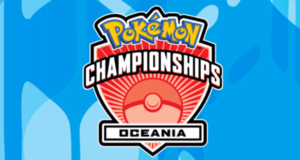 After reading this article, you will hopefully have started to develop an understanding of how to play against GX Pokémon, and which GX Pokémon you are likely to face in competitive play. At a cost of a single grass energy, Chloroscythe is one of the cheapest offensive GX moves available. It is essentially a lower energy cost, more potent, Sacred Sword. However, while the damage ramp per energy is decent, and there is no ceiling to the damage output*, the grass requirement means this GX attack will only reach its competitive potential in a deck that has the space to run 4-5 grass energy. 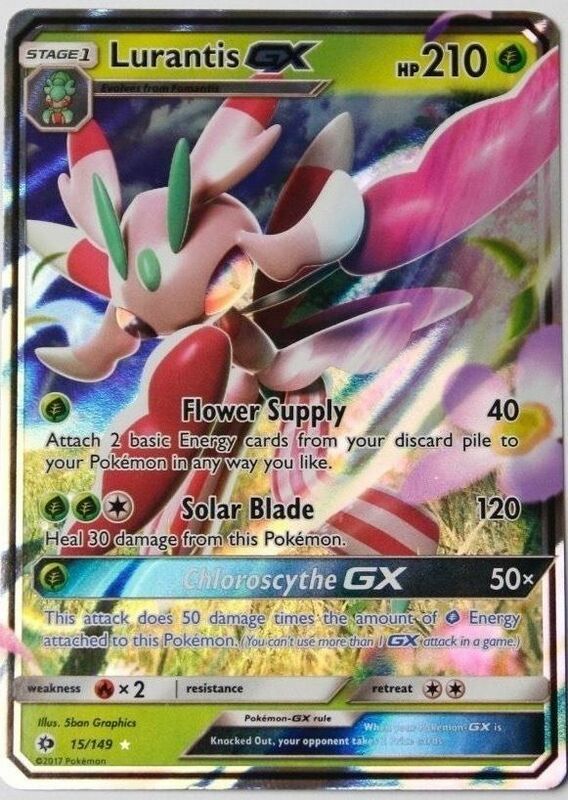 Synergy with Lurantis GX’s first move, Flower Supply, means that it is possible for a 4-energy Chloroscythe to be achieved on turn 2 of the game without the use of items. 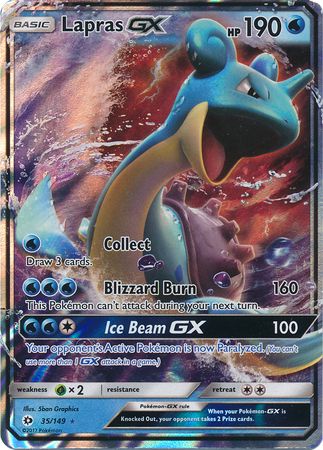 With a base of 200 damage and a cost of three energy, Burning Slam deals the highest guaranteed damage per energy of any GX move. This attack also uses the new burn mechanic, which means Burning Slam is likely to deal 220 damage to the opposing active Pokémon. This is relevant math to deal one hit knock outs on 210 or 220 HP Megas or fury-belted EXs or GXs. Unlike the attacks of fire Pokémon in previous sets, Burning Slam does not discard fire energy attached to Incineroar to pay for the attack. 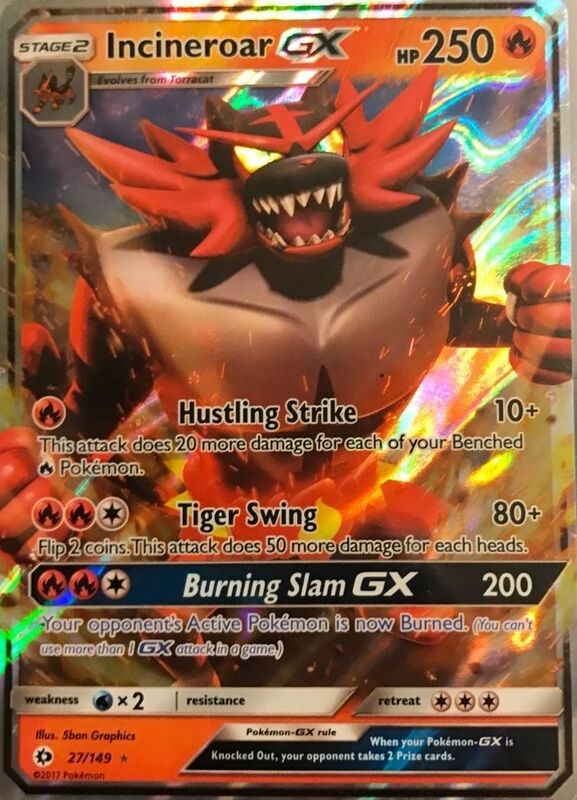 Importantly, this means that Incineroar can follow up a Burning Slam with Tiger Swing on the next turn. Unfortunately, there are no abilities or attacks on this card that accelerate energy to help satisfy the FFC energy cost of Burning Slam, nor do any of the other attacks have effects that interact with Burning Slam in any way. While 10 damage counters (100 total damage) may seem few for a 3-energy attack, the strength of Divide is in it’s ability to spread damage across your opponent’s board, damage benched Pokémon without being affected by Mr. Mime’s Bench Barrier ability, and potentially take multiple knock-outs at once. At PCC, this attack has a very achievable energy cost. Decks can splash in a single psychic energy to satisfy the requirement, and the attack can be powered through two energy attachments. 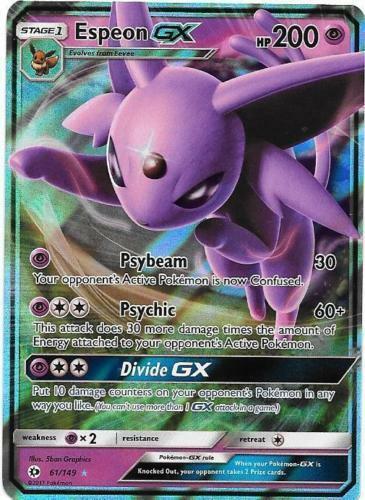 The same cost applies to Espeon GX’s second attack, Psychic, which may deal enough damage to threaten a KO on a Pokémon through Divide (even if said Pokémon retreats to the bench). I suspect that Divide will be best utilised in decks that require foresight, and complex damage calculation for perfect math knockouts- such as with Bats, other Pokemon that place damage counters, or Pokemon with snipe attacks. In a format or meta dominated by basic non-GX Pokémon, Lunar Fall would be an incredibly strong GX move. It is a guaranteed knockout on Pokémon even if they are on the bench. Most decks will offer at least Shaymin EX as a target for this attack. 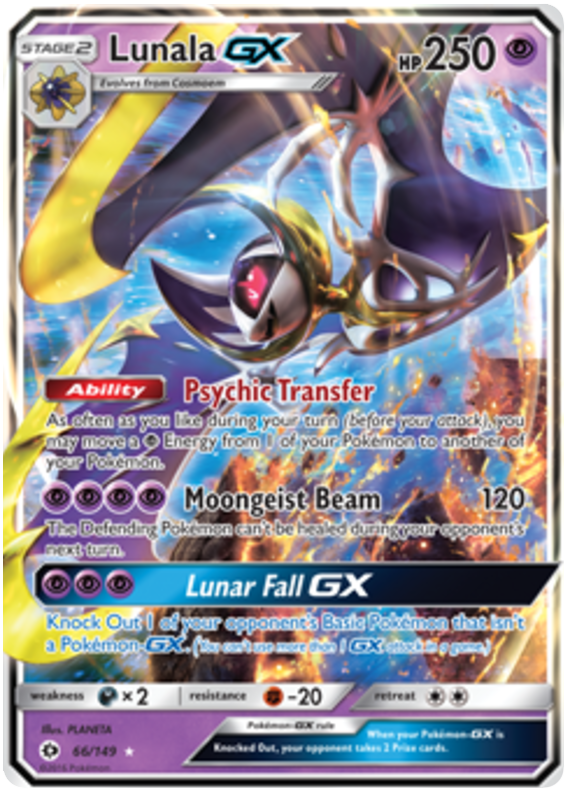 At PPP, the energy cost for Lunar Fall is terrible, and makes it only playable in a dedicated psychic deck. Lunala GX’s Psychic Transfer ability, and the trainer card Max Elixir, make the cost more reasonable, but still difficult. Gumshoe Chance is reminiscent of Dedenne’s Energy Short. 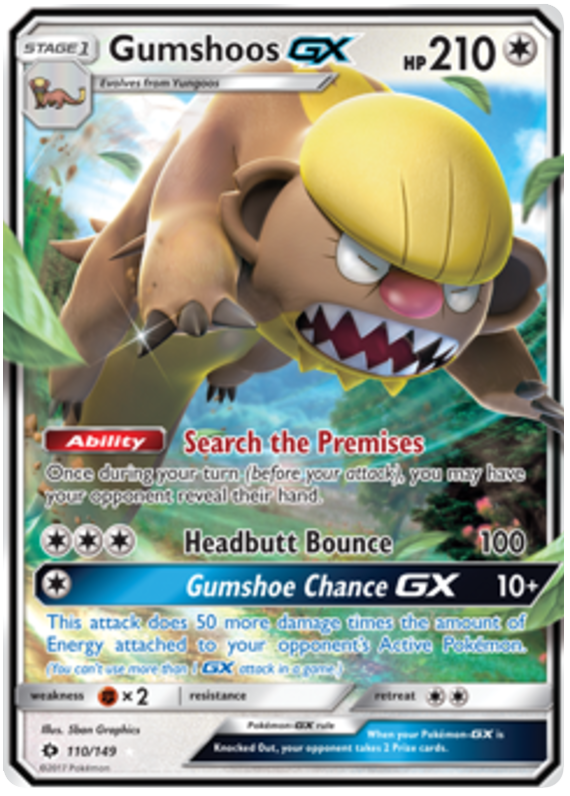 However, while Gumshoe Chance has the potential to be much more powerful than Energy Short, Gumshoos GX is not backed by Dedenne’s meta-relevant energy typing. Gumshoe Chance requires at least 4 energy on the opponent’s active GX or EX to achieve a one hit knockout. This means that it is dealing soft damage, which a savvy opponent can play around. The GX move also has no real synergy with the ability Seach the Premises, or Headbutt Bounce- other than the fact that Gumshoe Chance and Headbutt Bounce both deal medium amounts of damage for colourless energy. 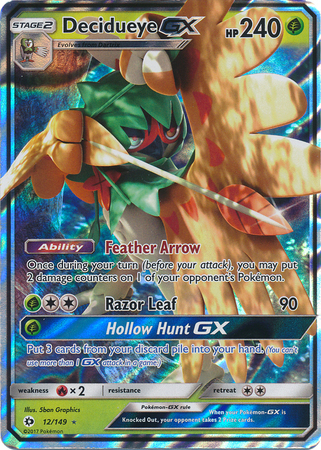 The only time I see this GX move (and to be honest, this entire card) being competitively viable is at a prerelease. This is the standard that all GX moves should aspire to be. Mad Bull is a revenge-style GX move that is reminiscent of Reshiram and Zekrom’s Outrage attack. The CC cost can be satisfied in one turn by a DCE, which means that this attack is highly splash-able. With only 8 damage counters on Tauros, Mad Bull can deals a base of 240 damage. This creates significant problems for opponent’s who cannot achieve one hit knockouts on Tauros. These opponents will have to play around Tauros GX through Lysandre or bench sniping, or probably be forced to trade prizes evenly or at a loss, to take Tauros GX down. Mad Bull works particularly well in decks that play Ninja Boy. The threat of a Ninja Boy into Tauros GX at any point in the game, may influence your opponent to alter their strategy. It adds a level of complexity to their game. 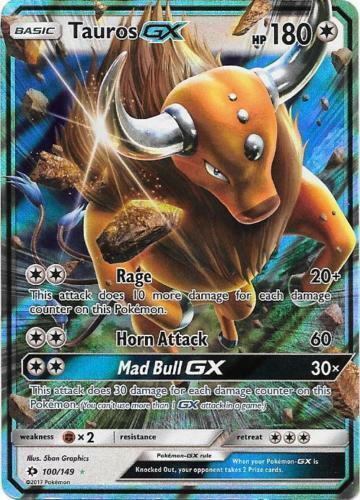 Further, it has high synergy with Tauros GX’s first attack, Rage.This means Tauros GX has viable and related attacking options beyond it’s GX move. It does not become a dead card on the field. At CCCCC, the high energy cost of Pulverising Pancake harms it’s splash-ability, as many decks do not have 5 energy to commit to one Pokémon. However, the energy cost is consistent with the attack’s damage output, and Snorlax GX can utilise DCE and Max Elixirs. 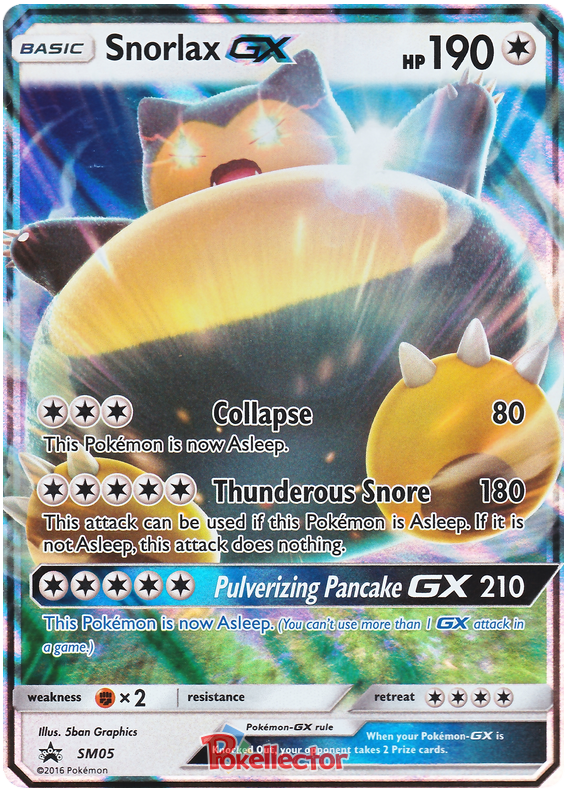 Pulverising Pancake synergises perfectly with both of Snorlax GX’s other attack, if you can compensate for the ridiculous energy cost, this is one of the better GX moves. It would be a good choice for a Big Basics deck, or a deck that is geared towards loading one Pokémon with a significant amount of energy. Even Ninja Boy from Yveltal EX to Snorlax GX would not be unreasonable. Lycanroc GX is the only fighting GX Pokémon, which means that LycanFang is the only GX move that can utilise strong energy. This is particularly important because LycanFang’s base damage of 200 is not enough to achieve a one hit knock out on Megas or most EXs and Basic GXs with fury belts. 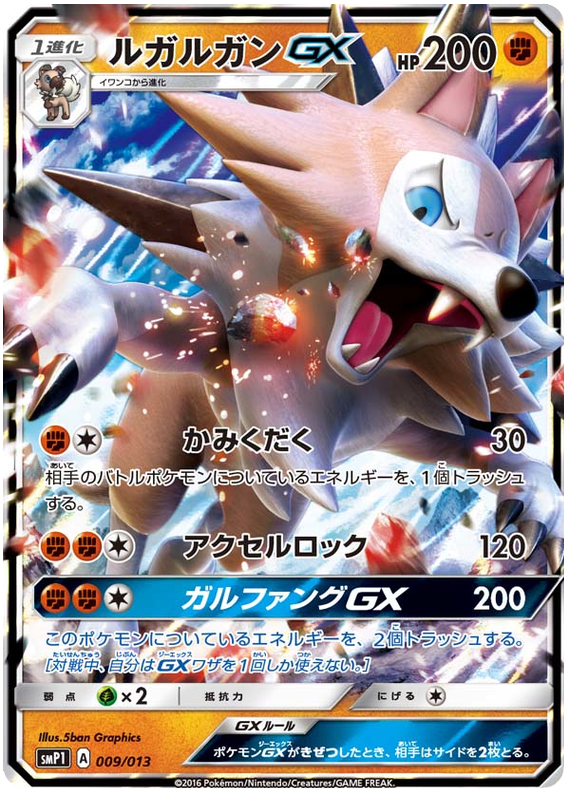 Lycanroc GX’s Crunch attack may be used for chip damage, and to prevent the opponent’s active Pokémon from attacking or retreating next turn, thus setting up for a LycanFang knockout on the following turn. 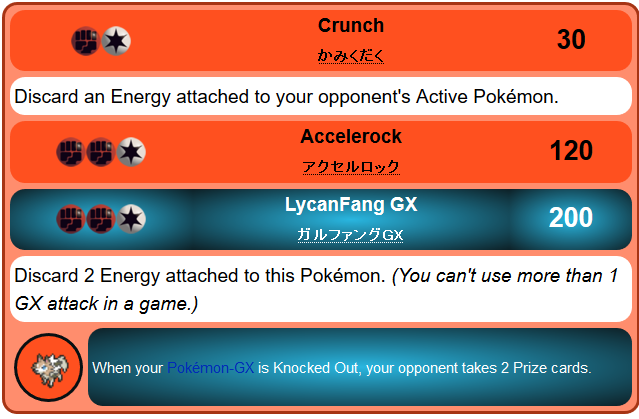 Unfortunately, FFC is not an easy energy cost to fill, and LycanFang requires 2 energy to be discarded, meaning that Lycanroc GX cannot easily follow it’s GX move with Accelerock. 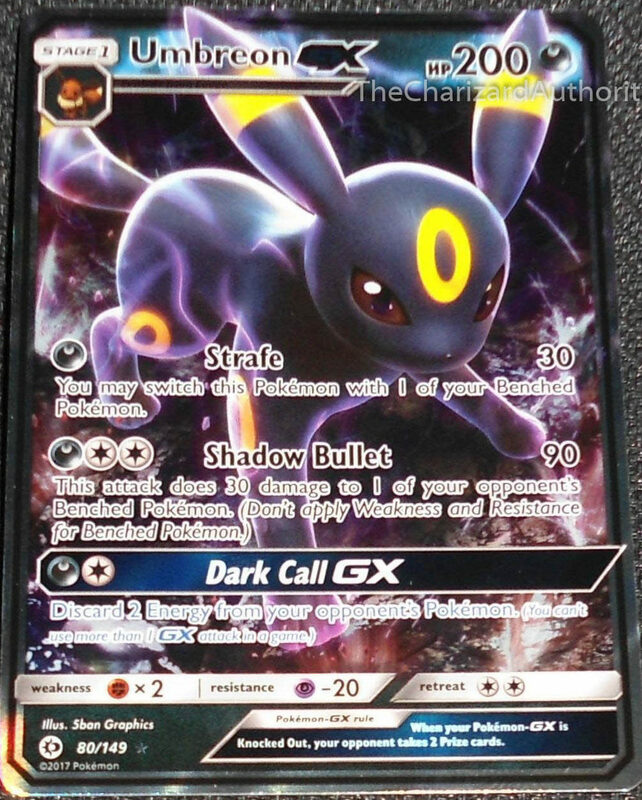 Carbink Break may provide an energy acceleration option. Ice Beam is perhaps one of the more difficult GX moves to evaluate. It does below average damage, has an odd energy cost, but also paralyses in a low-switching card format (this means it is likely that you will trap the opponent’s active Pokémon in the active position). Paralysis could buy you a turn to hit that crucial supporter or set up an additional Pokémon or ability on the bench. For example, Ice Beam could be used to trap the opponent’s active Pokémon while you play a Professor Sycamore to dig for a Lysandre. On the next turn, you could Lysandre a benched Shaymin EX and take two prizes with Blizzard Burn. Alternatively, Ice Beam + Blizzard Burn could be used to achieve a two hit knockout on pretty much any Pokémon in format. Hollow Hunt is essentially like announcing Puzzle of Time for 3 cards as your attack for the turn. It can be particularly useful late-game to recoup important resources. It is particularly strong after you have N’d your opponent to a low hand-size or have played Delinquent, and the threat of your opponent playing an N in retaliation is low. Even if your opponent does play an N after you have used Hollow Hunt, the 3 resources you recouped from your discard pile, are now live in your deck. In terms of competitive viability, Tauros GX’s Mad Bull and Primarina GX’s Grand Echo are at opposite ends of the scale. Until some kind of damage manipulation (similar to Boundaries Crossed- Dusknoir’s Sinister Hand ability) becomes tournament legal, spread damage becomes incredibly popular, or Archie’s becomes viable (OMG Primarina GX is not even a basic! ), it is very unlikely that Grand Echo will see any competitive play. It may be useful in some kind of damage denial or damage suppression deck, but it is only on very rare occasions that you would want to give up a turn of dealing damage, for a turn of damage healing. 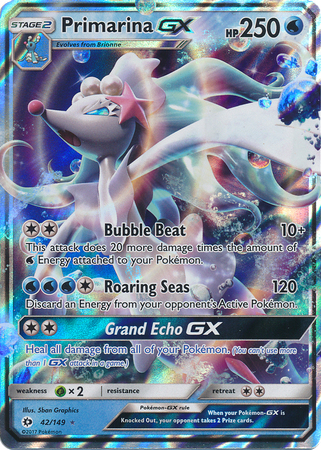 Further, Grand Echo does not have any synergy with either of Primarina GX’s other attacks- e.g. while Bubble Beat can be satisfied by a DCE, it mainly benefits from basic water energy. 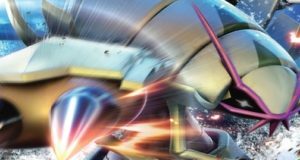 Sol Burst is one of the simplest GX moves in terms of knowing when to use it. Answer: straight away. This attack acts to thin the deck, which means you are more likely to draw supporters, trainers or other non-energy resources. However, it reduces the efficacy of max elixirs. Given that decks do not run a significantly large number of energy, and attachments are usually bound to the Pokémon, it is essential that you ensure that any attachments through Sol Burst, are not risky attachments. It is important to note that the attack allows you to attach 5 energy CARDS to your Pokémon in any way you like. This means you could theoretically attach a Dark and 4 x DCE to an Yveltal EX, or 2 metal energy to the active Solgaleo GX and 3 to a benched Solgaleo GX to prepare for two consecutive Sunsteel Strikes. Alone, or in combination with a Team Flare Grunt or Hammers, Dark Call could completely shift the momentum of a game. Successfully timing the attack requires some insight into your opponent’s deck and style of play, and some critical thinking about the game state. Is it important to prevent your opponent from gaining any momentum early on in the game? Or is it a great late game attack, when your opponent has no way to retrieve energies from the discard pile? Remember that your opponent will have an opportunity to attach an energy on their turn, so the attack may only result in a net -1 energy on your opponent’s field, so is it just worth dealing damage instead? Dark Call requires DC, which means it can be splashed fairly easily into a non-dark build. Whereas on the flip side, Dark Call also works well in the current dark builds, as many run a 1-of Team Flare Grunt or Hammers. The attack is not very potent against decks that run off or may only have one energy in play (like Greninja), that are able to energy accelerate (particularly from the discard pile, like Lurantis GX), or against Magearna-EX (Steam Siege) decks. 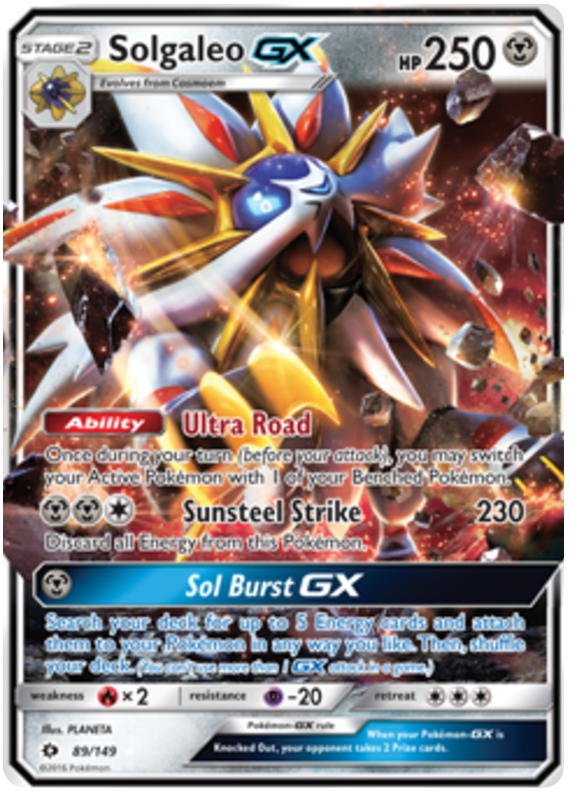 Most of the offensive GX moves are very strong, and are designed to be able to achieve one-hit knock outs on even the bulkiest Pokémon in the format. However, it appears there are not very many splash-able GX cards in the Sun and Moon set. This means we may see many of the same GX Pokémon appearing in decks that do not centre their strategy around a specific GX attack. Special thanks to fellow Sydney player, David Patane, for his contributions to this article.